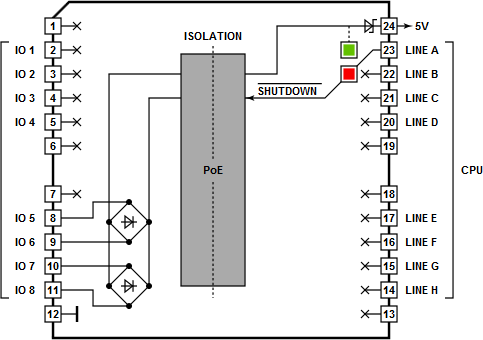 Function: Isolated PoE power supply with 5V output, shutdown control. Also can be used as generic isolated power supply with 35-60V input range. This Tibbit is capable of generating up to 1.3A of 5V power from the external PoE power source. As the PoE device, this Tibbit must be installed in the POE socket. On the TPP2 board Tibbit #23 will occupy sockets S9 and S11. 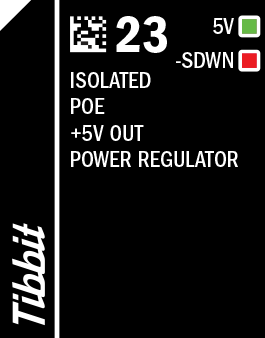 On the TPP3 board this Tibbit will occupy sockets S25 and S27. To connect the Tibbit to the Ethernet lines, four jumpers located next to the RJ45 jack will have to be in the "PoE (1-2)" position. Tibbit #23 can also be used as a generic isolated power supply. The 35-60V input range makes it ideal for applications relying on 48V power. In case of non-PoE use the external power is applied (in any polarity) via line pairs IO5/IO6 or IO7/IO8. There is one green and one red LED. The green LED is connected to the +5V output and lights up when the voltage is present on this line. This LED's brightness varies depending on the load current. Red LED is connected to the -SHUTDOWN line and lights up when the line is LOW (i.e. when the power supply is in shutdown).